The front: Looking cool at the batting cage. Not sure what the ballpark is with the blue seats – could it be Dodger Stadium? The back: Fifteen years in the major leagues didn’t leave room for a blurb. The player: Robinson had a difficult time with the Yankees as the heir apparent to Roger Maris, struggling with injuries and the booing of the Yankee fans. 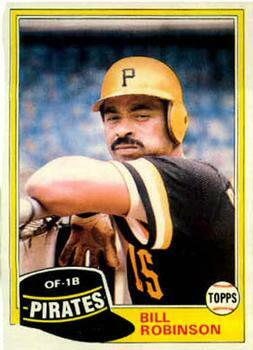 He didn’t really blossom until he came to the Pirates, helping the team win a championship in 1979. He hit 166 home runs in sixteen big league seasons. The man: Robinson went on to a long coaching career, most notably mentoring Darryl Strawberry and Dwight Gooden on the Mets in the 1980s. He was working as a minor league hitting instructor for the Dodgers in 2007 when he died in a Las Vegas hotel room at the age of 64. My collection: I have 16 of his cards, from 1967 to 1983. 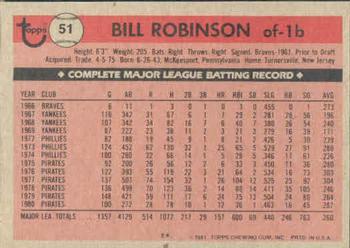 I would be interested in trading for 1968 Topps #337, 1969 Topps #313 and 1976 Topps #137.